Ok. It has been a while. I’ve been vacationing. 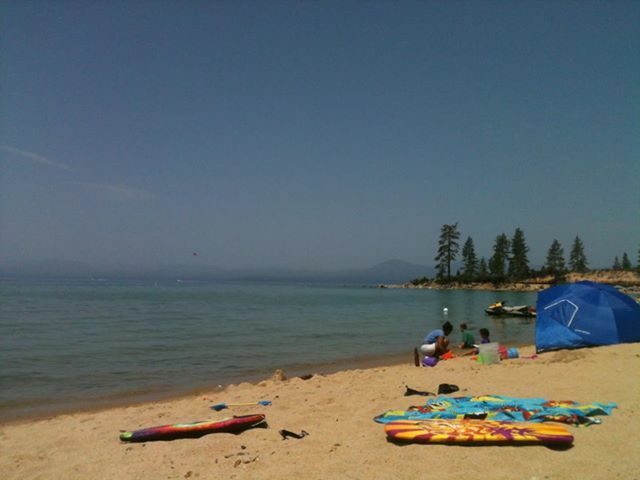 Here’s a photo of Lake Tahoe with fabulous fab girl. we went a few weeks ago–it’s all a blur now. It was wonderful. I’ve just returned from Florida. I am just now getting into wasting time. Yesterday I looked at every pair of jeans at the salvation army. I wasted time on facebook and responded to things from six months ago. I don’t know what I’ve been doing. I started low carbing/real fooding (which I already basically did). I have been watching netflix and hulu. kicking back basically. not getting much of anything done. I have a good tan now, which I guess is okay, just don’t tell any goths or dermatologists. Sooo…wasting time. I was so caught up in my own worries, and my teaching career, and what to do about it, that I couldn’t effectively waste time. I couldn’t really relax. I’d think, how do these people have the time to facebook or thrift shop? So what is the health benefit of wasting time? Okay, this is kind of too personal, but I know my health is returning–and I know because my *&^ drive has returned. It’s the weirdest thing. I guess I’m not as old and sick as I thought I was. Hooray! This entry was posted in mental and emotional well being, Uncategorized and tagged awareness, care of the self, gratitude, impermanence, relaxation by Project Easier. Bookmark the permalink. Being, I imagine it to be, not wasting. Welcome home.